The (C/PbO2, Pb+Sn/PbO2+SnO2 and Pb/PbO2) electrodes containing lead dioxide which is characterized by high oxygen evolution overpotential, inexpensive, consumes less electrical energy and is inert for acidic and basic media. These electrodes were prepared by electrodeposition and used as anodes for electrochemical degradation of Reactive Black 5 (RB5) dye in aqueous solution. 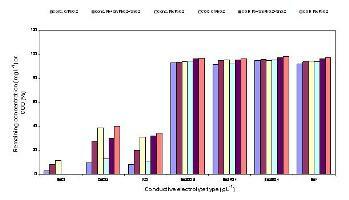 Different operating conditions and factors affecting the treatment process including current density, temperature, initial concentration of RB5, pH, type of conductive electrolyte and time of electrolysis were studied and optimized. After 10 min, nearly complete degradation of RB5 was achieved (97.4%, 91.90% and 88.57% using C/PbO2, Pb+Sn/PbO2+SnO2 and Pb/PbO2 electrodes, respectively) at pH 7.24, current density 20 mA cm-2 and in the presence of NaCl (2 g L-1) at 30°C.